One of my favourite reads every two months is Slingshot. This is the journal of the Society of Ancients, based in the UK. The Society is a collection of wargamers, historians (military and otherwise) whose common interest is ancient military history and playing games with small soldiers (or similar). Over the last couple of years the journal has changed its shape and the cover to the left here is the current iteration of the journal. It is now printed with a soft cover and colour throughout, with more colour illustrations to illustrate articles (we do live in a colourful world after all). The journal now looks and feels more like a magazine than it has ever felt and whilst it avoids a look that is “slick” it does feel good reading through it. The contents this month consist of the usual sections – editorial, guardroom (that’s the letters to the editor – some people still do write them), figure reviews and book reviews. In addition this month there are articles on the Seventh Crusade, the Role of the Mast of Dragons (Later Romans), a continuation of East Roman Cavalry Warfare and Tactics c. 410-641 as well as some specifically wargaming topics, such as the report from the 2011 Victorian Field of Glory Championship and perhaps my favourite article this month, the Ruleset Round Table where the authors of a number of wargaming rules were asked the same questions. Some interesting reading indeed in there. One thing I was pleased to see was William Shepherd’s Plataea receiving a very high accolade from a reviewer, an accolade I agreed with when I wrote Plataea 479 BC – Part 2. 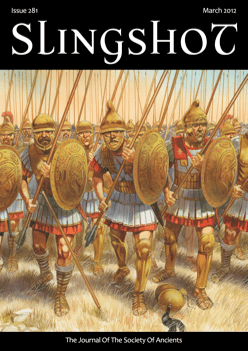 If you are not a member of the Society of Ancients but you have an interest in Ancient Wargaming or Ancient Military History, then I suggest you head over to their website – it is not expensive for a year’s subscription and worth every cent. Round 5 arrived. For this round I had to face the Wars of the Roses English of Peter Braham. Peter’s two sons, Bas and Sam, were also playing as juniors in the competition and both finished higher up the table than Dad. I was a little concerned as one of the options available to the Wars of the Roses English is to take some artillery. Artillery is not nice to elephants, able to destroy them at a distance. However, I had decided to battle three times with Nellie and three times without and so this game I took the elephant general option. I also rolled high again on aggression and so was the attacker once more. As I was the attacker, Peter selected the terrain – two woods, a road and a steep hill with a crest line running along it. I selected sides and ended up having to attack into the terrain to get to Peter’s army. I sent my light troops and one blade on the right flank forward into the wood at the end to both protect the flank of my knights moving up the centre and to pin the English forces there. The centre was two knights and the elephant – focussing the attention of Peter’s blades, which were likely to be eliminated fairly quickly if the knights closed with them. My left flank then consisted of one more element of knights – providing some mobility there – four elements of bows and the remaining blades. These were sent across the hill and the flat area to my far left. 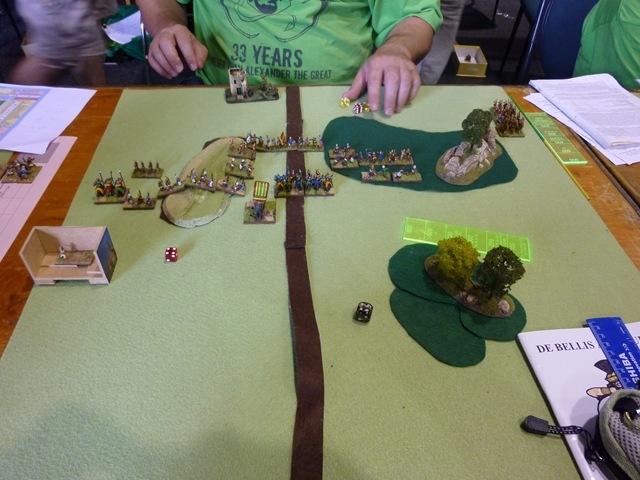 As it turned out, the major part of the fighting occurred there on my weak left flank with the bows finally, after 5 games, causing a casualty. My knights also won out against the English mounted troops and the blades on the hill accounted for the rest of the English. This was a close tough battle and could just as easily gone either way. 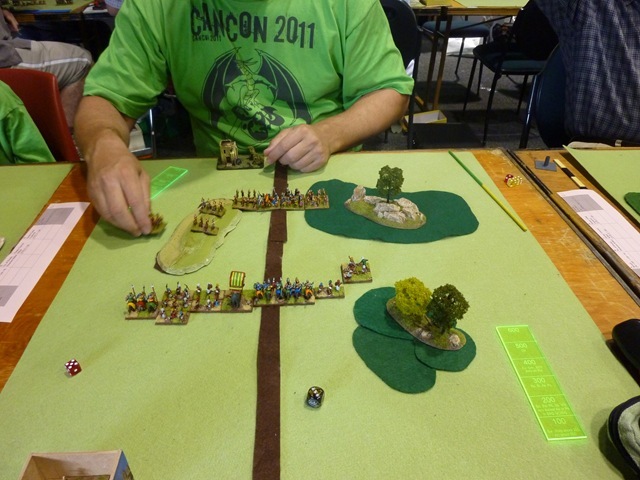 The second photograph shows the battlefield at the end of the battle with my forces in control on my left, his forces pinned on my right and the knights and elephant still focussing the attention of the English blades. Another 8:1 victory and I was starting to look like one of the players to beat. Doug Melville was on 5 victories from 5 games at this stage (having just beaten one of Peter’s sons) and Murray Woodford was, with me, on four victories at this stage, as far as I understand. One more round to go!